It’s here! Watch first teaser for its upcoming Marvel’s Inhumans TV show, from ABC. The upcoming first season stars Anson Mount, Serinda Swan, Iwan Rheon, Ken Leung, Eme Ikwuakor, Isabelle Cornish, Mike Moh, Sonya Balmores, and Ellen Woglom. Based on the comics by Stan Lee and Jack Kirby, Marvel’s Inhumans features the “epic adventure” of the royal family including the King of the Inhumans, Black Bolt (Mount), who’s voice is so potent with a mere whisper, he can take out a city. The first two episodes of Marvel’s Inhumans TV show will debut exclusively in Imax theatres on or around September 1, 2017. The live-action series will then premiere on ABC on Tuesday, September 26, 2017. Marvel Entertainment also published the new Marvel’s Inhumans teaser on Twitter. We’re including it too, because sometimes networks take down their teasers from YouTube. What do you think? Do you plan to check out the first season of Marvel’s Inhumans TV series? Have you read the comics? Let us know, below. 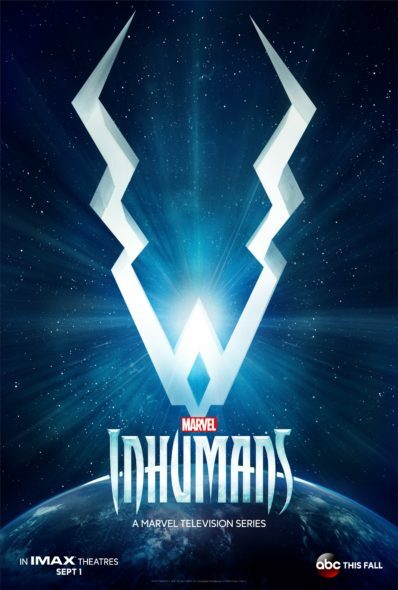 The inhumans tv series !hopfully! will be a good show for MARVELs inhumans season 1.I haven’t read the comics but I have seen the inhumans started off in Agents of shield season 2.with sky getting her powers. then that was the start of the INHUMAN story lines and every fan of marvels TV shows and MOVIE`S out there will agree with me that the shows and films will get stronger for all the FANS out there.